The film is written and directed by actor Stanley Tucci, and is his fifth directorial effort. And he brings along one of the lucky performers from his first film, “Big Night,” an unrecognizable Tony Shalhoub (“Monk”). The film – based on a true story – is deliberately paced, expressing the more leisurely and deeply felt times. One of the funnier bits is Hammer’s character constantly changing his airline flight as the portrait sitting goes on, something that may be impossible with such ease today (or with many fees attached). This is mostly a fascinating character study, as Geoffrey Rush has an instinct for creating eccentricity with the smallest of gestures. Even though the picture fades out rather than ends, it still resonates with the clash of the fine artist versus the writer… everybody wins. 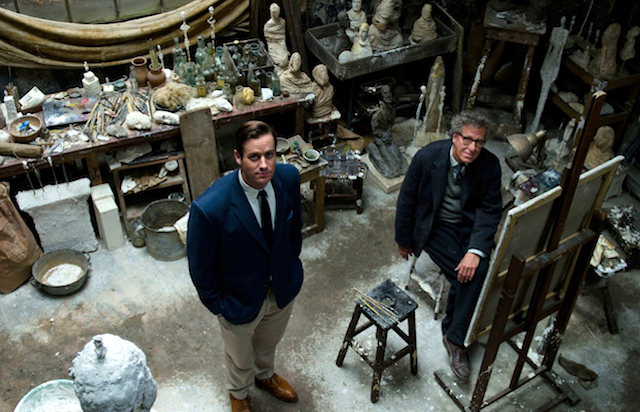 Paris in 1964 is the perfect refuge for American critic and writer James Lord (Armie Hammer). 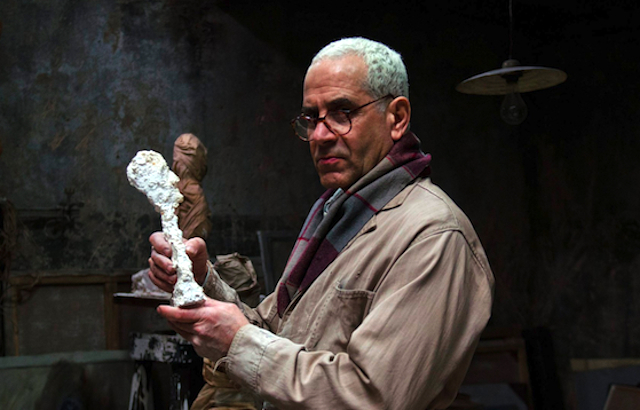 In his overview of the city’s art scene, he happens to meet the Swiss painter and sculptor Alberto Giacometti (Geoffrey Rush). The artist compliments the writer by asking him to sit for a portrait painting. Lord agrees, and finds himself in a situation that evolves into something akin to a trap. Giacometti initially told Lord that the sitting would only be a few days. But the weeks go by, and the writer – who had intended to go home to New York City – is stuck with his commitment. In the meantime, he observes the artist’s wacky life, which includes his wife Annette (Sylvie Testud) and mistress Caroline (Clémence Poésy). One sane person seems to be Alberto’s brother Diego (Tony Shaloub), and he may have a solution out of the endless portrait sitting. Rush and Hammer have good chemistry. The handsomely manicured American, with his crisp Kennedy-era suit, is in contrast to Rush’s tortured artist, with his messy clothes, schedule and life. They play off each other like a comic ping-pong act, with Hammer as Lord giving pure deference to the great Giacometti, and the artist rewarding him with an indifference that is perfect in its selfishness. Lord’s attempt to infiltrate his friend is equally absurd… there is no way you can figure out someone who can’t be pinned down. The tension of the “sitting” is delivered well in the atmosphere that director Stanley Tucci creates. Much like his first film “Big Night”… where the characters are waiting for the singer Louie Prima, and that seems important until it isn’t, the “painting” that is being created has nothing to do with what actually occurs. This is also a sharply observed overview of a different era, where famous artists could live in their eccentricity, and days could be spent in cafes and graveyards, talking about life. Tony Shaloub, interestingly portraying a brother-to-a-prodigy as he did in “Big Night,” leads a great supporting cast, who provide the main characters with actions that motivate them. He is unrecognizable in closed cropped gray hair, and uses his famous low-keyed persona to great effect. The women in the artist’s life… his consistently ignored wife Annette and wild-eyed mistress Caroline… are portrayed by Sylvie Testud and Clémence Poésy as fiery European lovers of life, pushing back on the conventions of traditional or repressed societies elsewhere. It’s a true story, so it comes with a “true conclusion” that isn’t as satisfying as some dopey fiction, but such is real life sometimes. Basically this was about a time that had a bit of romance, a bit of frustration and a bit of sorrow. There is nothing different in those human experiences in our current situation, it just seemed more deeply realized through the interaction of an artist and his muses a long time ago.